"Koizora" is a love story that was originally published on the popular cell phone site Mahou no iRando. Story is authored by new writer Mika, and is based on her own experiences. The story was released in book form October, 2007 and sold more than a million copies in its first month. Emily Aug 08 2017 3:30 pm Okay, boy. I can't or i refuse to watch the other one because this was just the best. Amazing, i'm happy i watched this one. What a brilliant drama! Erena Fans Aug 10 2015 9:36 am Erenaaa!!! you are so beautifullll.. 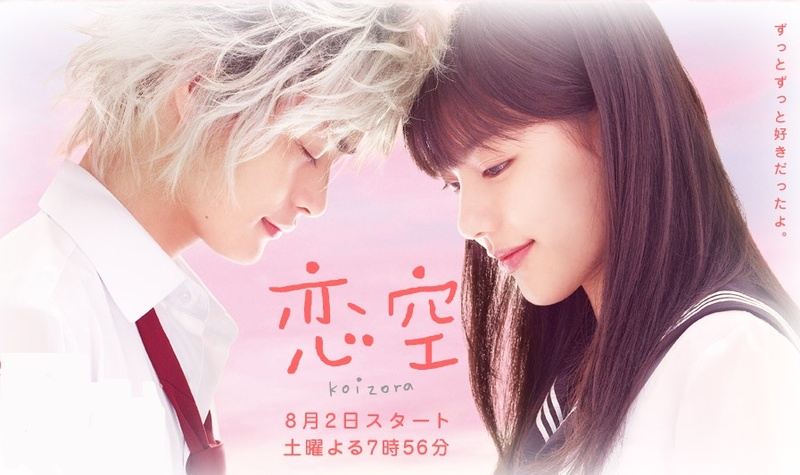 I miss Koizora drama. I hope can see you act as main character like Koizora. I will support you 1000%. ellery Jul 04 2015 7:50 pm I really love this movie. Even if I already seen it for how many times, still it broke my heart because of its ending but I still love how the story runs. Aziz May 14 2015 9:51 am Hmm I'm a little bit confused about the ending.is that mika's children or what? NattieyNats Mar 17 2015 7:38 pm This broke my heart in such a good way. It's like part of my life journey now. madiha Sep 22 2014 9:03 pm such a beautiful story no words just cried out so hard coz i have experience the pain of loosing a person whom i loved a lot and still remember her in my thoughts. please keep writting beautiful stories like this keep it up. movies like this gives you strenght to move on in life. thanks for giving us such a beautiful story. Kiki jimo Dec 06 2012 5:10 am I'm totally in love with this movie. Its sad though,to lose the one we love to cancer... Its realy a great movie of love..
nerissa Mar 02 2011 4:30 am i love this drama so much the cast and the story... this movie make me cry so much. Nique Jan 09 2011 6:58 am After i watched this movie I felt like OMG !!! that's amazing I like this Movie soo moch !! sighs* I enjoyed watching until they got to the loss of the baby and cancer stuff. I try to give plots like this a chance because characters. I liked Hiro and Mika. I thought they made an adorable couple. But getting sick with cancer is such a cliche and and easy out for dramas. What comes next? A lot of over the top dramatics, crying, and cheesy lines. I would have liked to watch Hiro and Mika struggle together as a young couple with his background and a baby on the way. It was just one thing after another and instead of feeling like ,"Omg! How awful! *tears*" I felt, "Geez, what's next? Cancer?" Da, da, DAAA!!! This is for sure, a great drama for those who are easily moved by true love and deathly illnesses. It has love, emotion, and good acting. This being based off a true story should also get you into it. I feel bad for whoever actually had to go through this. But I find that a lot dramas don't do stories like this justice or without ruining it. I hope to one day find a drama like this I can love. KOJI SETO Sep 13 2010 1:38 pm I adore Koji Seto, but this drama is wack. It's ultimately in the BASIC love story category. I've seen and heard BETTER love stories. Cancer? It's just too cliche. Don't get me wrong, but there's a whole lot to life&love in other levels. Those who like this story just haven't seen the worst and most fascinating love stories ever. Hikaru Aug 17 2008 10:13 pm when i bought this book i readdy dont know what kind of story and i dosent know that it was real story.. after bought the book i stated reading and i was cried.. because the story was really sad.. especally when hiro got cancer.. that's the reason that mika broke up with her boyfriend.. for me i can do that because if the person is specall to me..
when i finished that story i try to find the website.. and i try to look that website..
i learned about how love is important,, in future i think i have already boyfriend or husband so i will take care of my future boyfriend or husband..
this is last comment i wanna say something to MIKA-SUN & HIRO-KUN mika san totemo tsurakatta daroukedo yoku ganbarimashita ne im proud of you! hiro kun nagai aida youku gan to iu byoki to tattakate kimashitashi tsurakatta hibi moatta to omoimasu kedo youku ganbarimashita all of people loves you a lot! mochiron watashi mo ne..